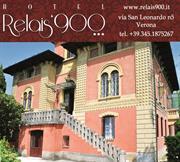 Hotel Relais ‘900 is our service company dedicated to your stay in Verona. Overnight stay in one of our prestigious rooms. Check in from 2 p.m. till 9 p.m., before 2 p.m. or from 8 p.m. to 12 p.m. on demand. Trips and tours arrangements in the historical side of Verona city or into the famous Valpolicella wine Valley.